Hochzeitsfotograf Hamburg Dipl.-Des. Kirill Brusilovsky: Mitglied in "Best of Wedding Photography"
Mitglied in "Best of Wedding Photography"
„We spent time looking over your site and we love your sense of style and your sense of fun -- it infuses every one of your photo stories. 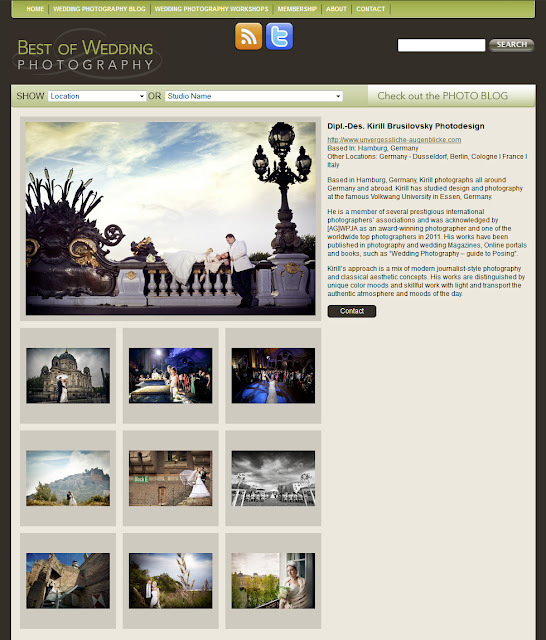 We really enjoyed your stunning imagery and coverage of Matthias and Tina’s wedding. One of our favorites (although there were many) was the image of the bride and groom with the various blue sky and cloud colour tones and the fireworks (#74). The picture of the little girl and boy about to kiss was priceless. Overall, we love your bold, fresh, beautiful images that really capture the moments and the honesty of the events you document. Nun bin ich dort in der besten Gesellschaft international bekannter Hochzeitsfotografen wie Ben Chrisman, Apertura, Jerry Ghionis und vielen anderen Stars der Szene. Ich bin jetzt schon öfter hier auf Deinen Blog gewesen und hab mir die herrlichen Fotos angeschaut. Da ich beruflich viel mit Hochzeitsfotos zu tun habe, kann ich Dir sagen: Deine sind schon zum Teil außergewöhnlich!